The brightness of the scintillations and the density of the tracks observed in the expansion chamber suggest that the particles are normal a-particles. 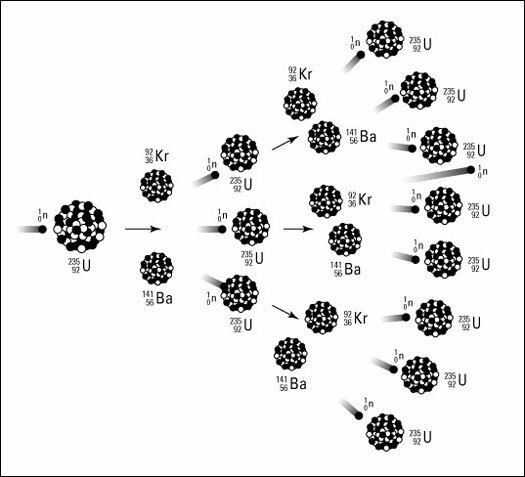 If this point of view turns out to be correct, it seems not unlikely that the lithium isotope of mass 7 occasionally captures a proton and the resulting nucleus of mass 8 breaks into two a-particles, each of mass four and each with an energy of about eight million electron volts. The evolution of energy on this view is about sixteen million electron volts per disintegration, agreeing approximately with that to be expected from the decrease of atomic mass involved in such a disintegration. Experiments are in progress to determine the effect on other elements when bombarded by a stream of swift protons and other particles. Cavendish Laboratory, Cambridge, April 16. COMPTON: We entered the balcony at one end of the room. On the balcony a dozen scientists were watching the instruments and handling the controls. Across the room was a large cubical pile of graphite and uranium blocks in which we hoped the atomic chain reaction would develop. Inserted into openings in this pile of blocks were control and safety rods. After a few preliminary tests, Fermi gave the order to withdraw the control rod another foot. We knew that that was going to be the real test. The geiger counters registering the neutrons from the reactor began to click faster and faster till their sound became a rattle. The reaction grew until there might be danger from the radiation up on the platform where we were standing. “Throw in the safety rods,” came Fermi’s order. The rattle of the counters fell to a slow series of clicks. For the first time, atomic power had been released. It had been controlled and stopped. Somebody handed Fermi a bottle of Italian wine and a little cheer went up. One of the things that I shall not forget is the expressions on the faces of some of the men. There was Fermi’s face—one saw in him no sign of elation. The experiment had worked just as he had expected and that was that. But I remember best of all the face of Crawford Greenewalt. His eyes were shining. He had seen a miracle, and a miracle it was indeed. The dawn of a new age. As we walked back across the campus, he talked of his vision: endless supplies of power to turn the wheels of industry, new research techniques that would enrich the life of man, vast new possibilities yet hidden.